Super Bowl XLV Is right around the corner and I was thinking about the two starting quarterbacks. They have a common thread. Guess how many major football colleges offered Aaron Rogers and Ben Roethlisberger scholarships coming out of high school? They received the same amount of major scholarship offers that I did. ZERO. Coming out of high school, neither were highly sought after or recruited by major colleges. They weren’t really at the top of anyone’s lists to play quarterback. Who would have guessed that they both would have made it to the top of the league, playing for the NFL Championship? Aaron Rogers, the Green Bay quarterback, got little interest from Division 1 schools. His only offer was to come to Illinois as a walk on. He declined that “impressive” offer of walking on and attended Butte Community College. After a year of playing at Butte, he caught the eye of California head coach, Jeff Tedford, who came to a Butte came to look at recruiting their tight end, Garret Cross. He played the next three years at California. Ben Roethlisberger, the Steeler’s quarterback, only played one year of quarterback in high school. Even though he had a good senior season and received some interest to play other positions, Miami of Ohio was the only school that wanted him to come as a quarterback. 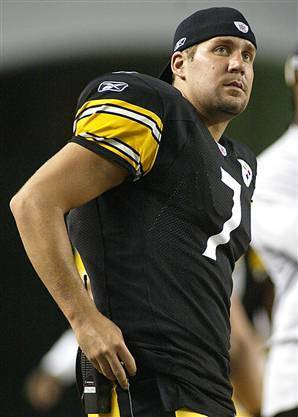 Besides his experience of only playing one year of quarterback in high school, Roethlisberger had yet to fill out to his “Big Ben” frame. Consequently, he agreed to go to Miami of Ohio and play for the Redhawks. Jesus’ disciples weren’t highly sought after either. They were far from heroes. Some were uneducated fishermen. Matthew was a hated tax collector. They weren’t in consideration as disciples for any of the other rabbis of the day. They were passed over as others were chosen for those positions. They were not the kind of material that I would have picked either to put in the “changing the world” category. I would have looked more at the educated and experienced leaders of the day. Jesus had other ideas. That’s actually good news. If you were always the person that everyone wanted to have around and considered a “hero” by those around, cheer up and stay positive. Jesus can probably use you too, but he has a history of choosing those that are underachievers and doing great things through them. God chose David to serve as King and he wasn’t the star quarterback of the local Jerusalem High football team either. He wasn’t a likely hero either. David was a young guy that kept stinkin’ sheep all day. He was “ruddy,” and “comely in appearance.” (I Samuel 17) God didn’t see what others saw. He saw a young guy that loved God and had potential that others didn’t see. David’s family didn’t see the potential in him and David probably didn’t know the extent to what God had in store for him either. David eventually became King of Israel and is remembered as a “man after God’s own heart.” Truth is, with God on your side, anyone can have potential. It doesn’t matter who you are, what others have said, or what your background is. If you will truly seek God and give EVERYTHING in your life to Him, he can do great things THROUGH you. God just might surprise you at what He will do through you as you are totally surrendered to His will and leadership. Did you think that you’re an unlikely person that would be used for greatness by God.? Good! You may just be God’s chosen person! Have you ever been used by God in a way that surprised you? What’s keeps most people from letting God use them in ways that are surprising? People today have many ways of communicating with each other. In our church, there are people that like Facebook. Others prefer texting. There are also other preferred avenues of communicating with people in my church, such as phone calls, email, newsletters in print, face to face conversations, and a personal hand-written note. What I’ve found is that if I want to communicate with EVERYONE in my church, I have to do ALL of the above or I miss some people. Those who prefer texting will miss my message if I only send a message out on Facebook, for example. We’re all different. Rick Warren says, “You cannot over-communicate.” I’m learning how true that is. In the same way that we all prefer different ways to communicate with each other, we are also wired differently in the primary way we connect with God. Fasting does it like nothing else for some people. Some can pray for 2 hours and totally feel God’s presence. I hate to admit it but after I’ve prayed for all that I know, my mind starts wondering to what’s for supper or something really spiritual like who’s going win the next ballgame. A runner who feels God’s presence most when he runs still needs to pray and read their Bible to stay grounded. Someone who feels God when they read their Bible still has a responsibility to help the poor. If you love to study the Bible, you still need to put it in action. (Faith without works is dead-James 2:20) If you’re an action person, you still have to know what the Bible says. Seek God and you will find Him. Seek Him in your preferred way, but seek Him in other ways too. The important thing is that when you seek Him, don’t give up. Keep seeking His presence. Keep your relationship with God a priority and keep it fresh by trying other “pathways”. You’ll find Him. What’s your preferred way to hear from God? When do you feel His presence most? Bill y Hornsby is admired by a lot of people. He is founder of the Association of Related Churches, which is one of the major sponsors of MJLfeChurch.tv “ARC”, as it is called, has started almost 200 churches in the past 10 years, including MJLifeChurch.tv. That’s a MAJOR impact on the world, all from the vision of Billy. That’s also just a fraction of what Billy’s vision is. He sees ARC planting thousands of churches. As I write this, Billy Hornsby is at death’s door. He contracted a very aggressive form of cancer and could pass away anytime. I heard that as sick as Billy is, he has asked God for just four more weeks so that he can finish the book that he is working on. (From Maurillio Amorim’s Blog) I’ve read tweets from a few pastors and people that have visited him in the past few days. Even though he must feel terrible, Billy is STILL pouring into them, encouraging them to keep holding out the word of life to a lost world. Scripture says that the rain falls on the just and the unjust, but it’s still hard to understand why someone like Billy must go through something like cancer and be taken away from those he loves and influences. I’m thankful for the influence of Billy Hornsby on my life, MJLifeChurch.tv, and on the thousands of people that ARC churches have impacted throughout the United States. I met Billy through an ARC event. I didn’t go up to him to meet the “celebrity.” He came up to me and was interested in what I WAS DOING. Billy truly sees his mission as doing whatever he can to let God work through him in furthering the gospel. Though doctors say that he could pass away anytime, Billy has asked for just four more weeks so that he can continue to pour into lives and encourage them to reach more people for Jesus. What would you do if you knew that you had just four more days to live? Why don’t we do those things now?